paris breakfasts: Kings of Pastry! Gerard Mulot Pastry Box, 9" x 11"
Pastry chefs and I have always seen eye to eye. 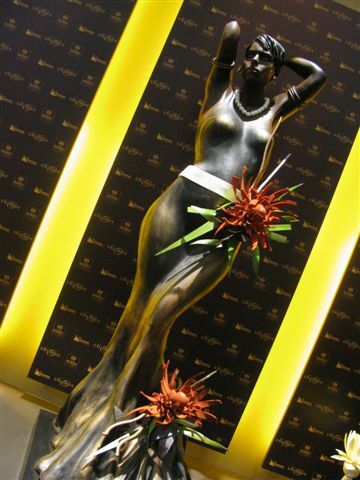 They are the 'artistes' in the cuisine, painting with chocolate and sugar. Of course they adored having their portraits on their own business cards. They really got my food art biz going. When I received an invite to a screening of KINGS OF PASTRY I was thrilled. It's about the 3-day competition of carefully selected French pastry chefs, sixteen in fact, all vieing for the much coveted M.O.F. 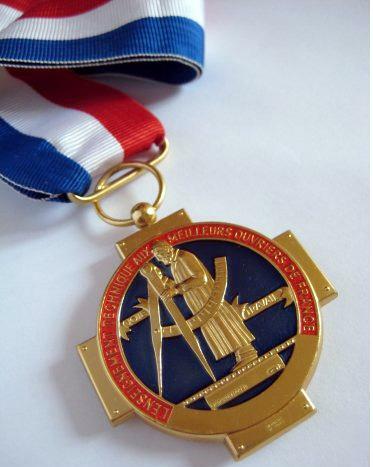 or Meilleur Ouvriers De France award in Lyon. As luck would have it, I went to Maine to paint and missed the screening, but they sent me the video and BOY OH BOY is it fun! "I never saw so many men sobbing at once"
You get to see top pastry artistes pushed to the limit, racing against time and each other to make their super, fragiles creations. You see top pastry judges of France (PH included!) tasting and grading the contender's art works (16 desserts) and their responses. Full of suspense...catastrophes beaucoup...even the judges are in tears. 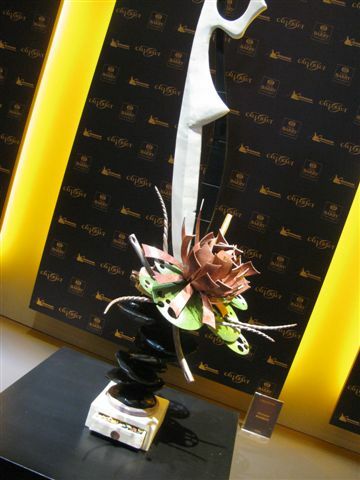 Pastry chefs of the highest order are required to make many confectionary sculptures... Usually made of sugar. 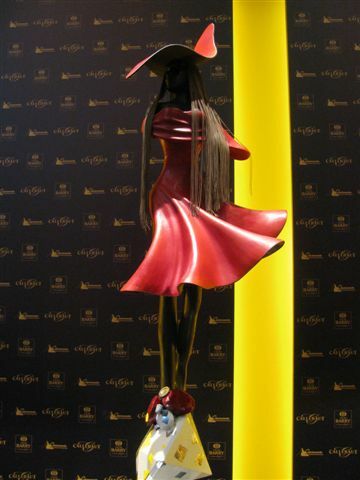 These chocolate masterpieces were at the Salon du Chocolat last October. Now I have a better idea of the enormous effort that went into making them. Oh the torture, oh the sleepless nights. 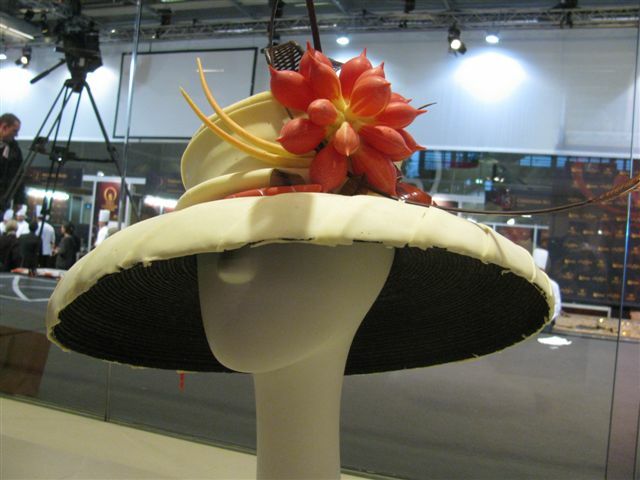 I attended the Coupe du Monde de la Patisserie in Lyon in '94 - words can not describe the fabulousness of it all. If only I'd had my Canon back then. Last June I returned to Lyon for a macaron class. 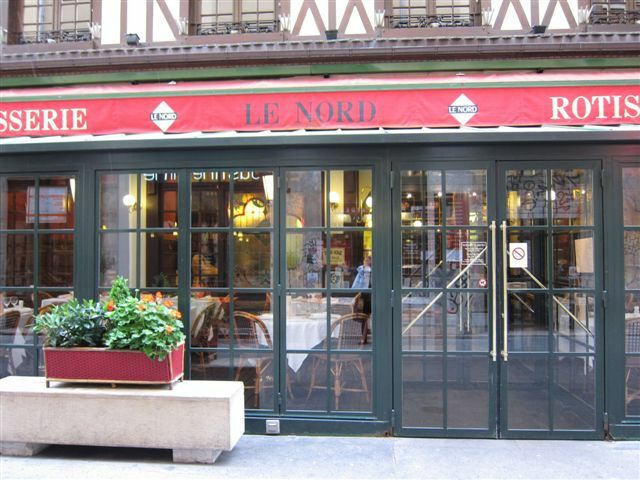 Instead I ate lunch at Paul Bocuse's Brasserie Le Nord. Very chaleureuse/warm indeed.. 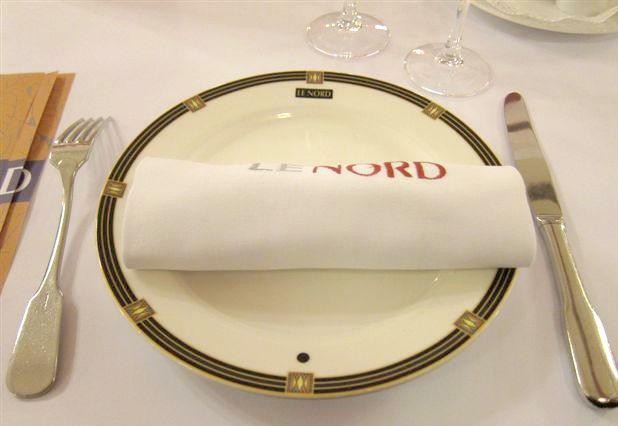 Very much in the old French tradition of quality and simplicity. 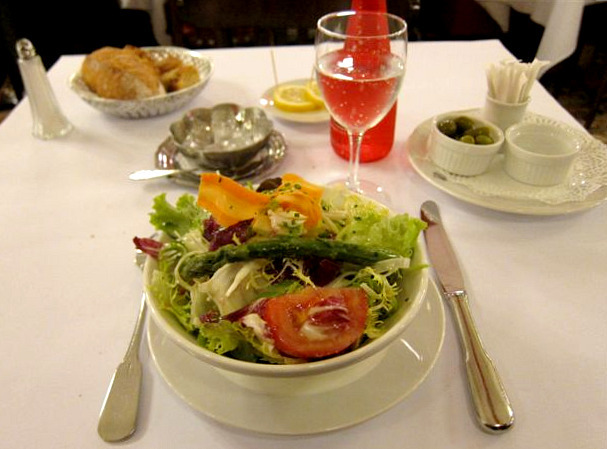 Bien sur you know I had une salade... And then the very traditional cote d'agneau for my main. Miam-miam When I asked for the l'addition they said I was an invitee/guest!? And go see the movie. I saw the Kings of Pastry when it made its North American debut at the Full Frame Festival here in Durham, NC. I loved every delicious second of it! I want my very own copy, too. I thought of you, Carol, when I saw the macarons. When the pastry students in the school make the messy macarons! Brilliant, thanks so much for sharing this, I will hunt it down immediately and Paul can watch it before he goes off to his chocolate making course. Hi Carol . . . I read your blog as often as I can and love every word! PS We live near DC and my daughter and I are looking forward to seeing you at your opening! I wanted to let you know that Paris Breakfast has been featured on Guide to Culinary School's list of the Top 50 French Cooking blogs. Boy, you are just flying high lately! Great photos, as always - and that dinner looks incredible. Is it playing there, now? Not seen anything about it here in SF. I'm sure I'd enjoy it. Must do a search for when it's coming our way. Your watercolor today is SO pretty!! I loved watching the preview, now I must see where I can see the whole movie. Looks great. Thanks for showing the video. 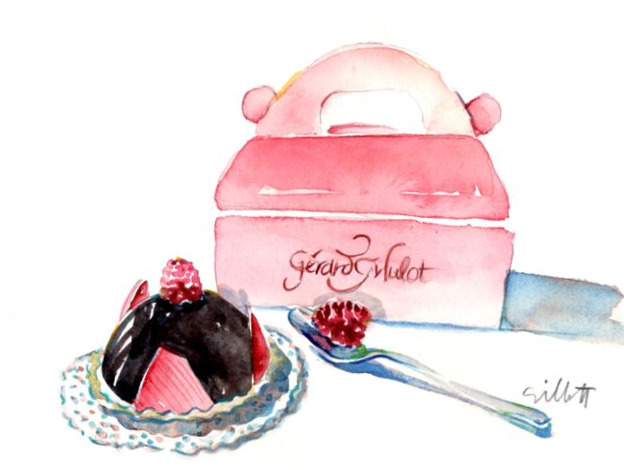 Love your luscious watercolor, great post and thank you for posting that short video for those of us who are neophytes to this pastry world -- this was an interesting experience to watch. 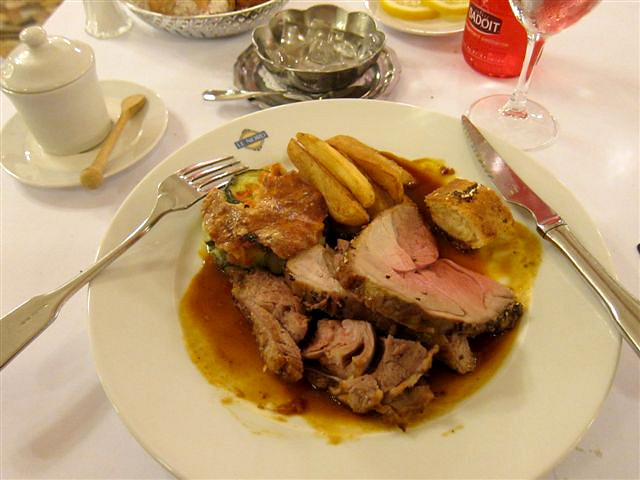 "Fine cooking is when the things you have cooked taste as they are. A vaincre sans péril, on triomphe sans gloire." 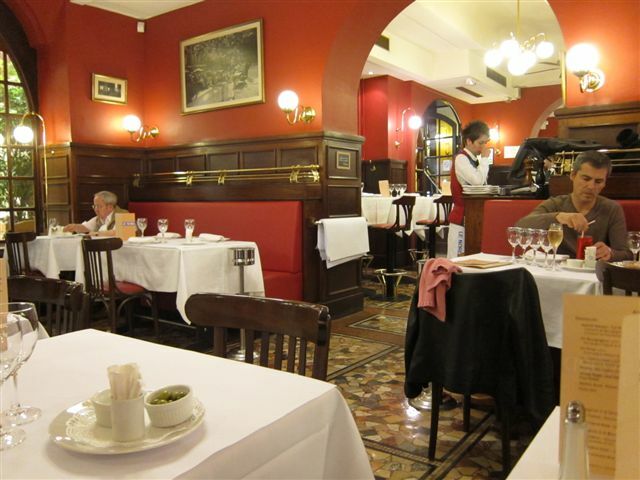 Your salad and lamb meal looks outstanding, and the ambiance of the restaurant so delightfully old world. I so agree with you about the old French tradition of simplicity and quality; it is evident is so many aspects of the Gallic arts de vivre. Carol, your blog is such a stand-out. It's not just your gorgeous artwork, it's the whole ambience you've created. Such a special place. The trailer alone was hysterical! I cannot begin to imagine the stress of competition! It's hard enough getting a meal for 4 on the table when every course is make-ahead and it's only the family! LOVE those reflections in the chocolate dome - looks like window highlights. I loved the trailer and only hope I will be able to see it here in Australia~fantastique!! and I love the way they refer to it as "Culinary hurt locker" loved this post Carol. 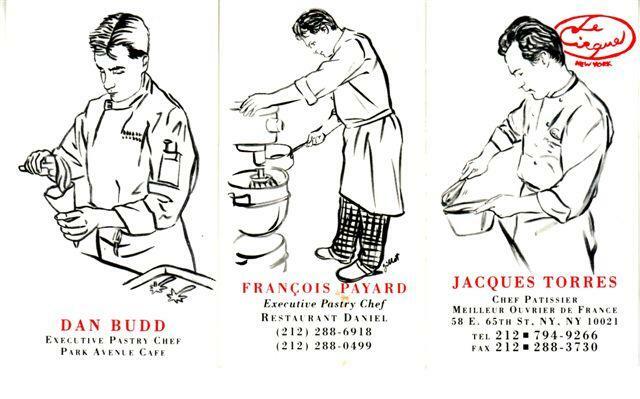 Kings of pastry...what can I say..
After watching it and wiping my tears away, I wished I was a man,a Frenchman, a chef, a damn good pastrychef being able to receive a MOF. Instead....I will try to climp the Mount Everest. 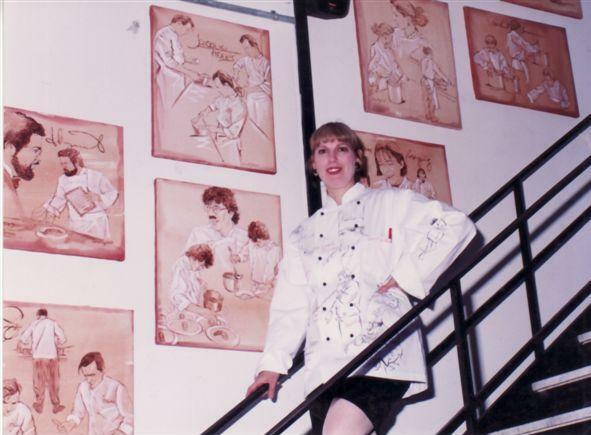 You are the Queen of Pastry art! I would love to see this film and see how they make all those beautiful and delicious treats. Yr Petit Dejeuner in Paris! Ottolenghi Passion Fruit Meringue Tart!